Two tools from the SketchUp Extension Warehouse are essential for 3D printing: CleanUp3 and Solid Inspector2, both created by Thomas Thomassen. 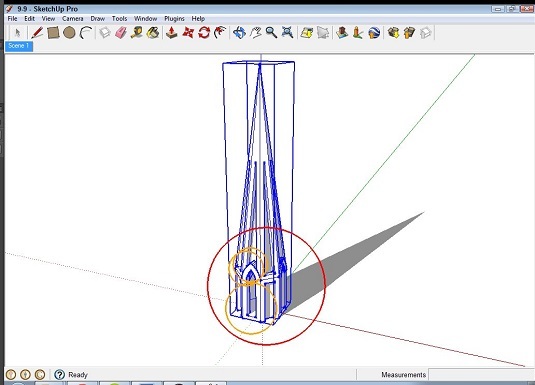 CleanUp3 checks and simplifies the geometry of your SketchUp model. It combines multiple faces, eliminates extraneous data, and erases any lines that don’t make a face. Two of the most useful CleanUp3 options are Erase Duplicate Faces and Repair Split Edges, which can be enabled in the CleanUp3 menu. Duplicate faces and split edges are errors that inevitably appear in your model as you work in SketchUp, and they drive 3D printers nuts. Both errors are hard to recognize and repair manually. CleanUp3 is also great at simplifying STL files (3D-printable files) you import into SketchUp. In this image, which shows the triangulated data you get from an imported STL file, the faces have been broken into hundreds of triangles. By removing that triangulation, CleanUp3 makes files downloaded from 3D printing communities (such as Thingiverse) easier to edit in SketchUp. An imported STL file, before and after running CleanUp3. Solid Inspector2 finds and highlights problems that are preventing your model from being a solid shell, and its usefulness can’t be overemphasized. It highlights problem areas and helps you automatically move from one error to next, making repairs much faster. It’s a tool that everyone using SketchUp for 3D printing should have. Solid Inspector2 is great at finding problems that need a quick fix. As you work on your model, get in the habit of running CleanUp3 periodically. Run Solid Inspector2 before you export from SketchUp to 3D print. It will catch any errors that would cause the print to fail.